In Westlake, Ohio, the building department issued residential remodeling and improvements permits with an estimated cost of $12.8 million in 2017, a 14 percent increase from 2016’s figure of $11.3 million—and one of the major focus areas has been the kitchen. Westlake was originally called Dover Village but the name was changed to avoid confusion with another Dover in Ohio. Then in 1957 it became a city measuring 16 square miles, the largest of Cleveland’s western suburbs. The following years saw rapid growth, setting the stage for residential remodeling and improvement projects as lifestyles evolved. As area kitchen designers introduced new and exciting plans, homeowners equally became enthusiastic about adapting these ideas to their situation. The median house size in Westlake is about 1,800 square feet, making it spacious enough for a variety of creative remodeling projects. With computer software, designers for kitchen remodeling in Westlake, Ohio, have many options to customize the kitchen layout and show you in 3-D what the finished project will look like. Then it’s time to talk about countertops, cabinets and appliances. Countertops are often the first decision to make, since they may affect the entire kitchen. There are more than a dozen types commonly available, differing mostly on price and material. 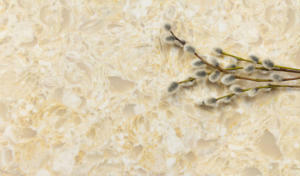 Golden White quartz countertops offer a classic look to your kitchen. With quartz, a look of elegance is added to the kitchen, particularly with a highly polished finishes. Since they are engineered, quarter countertops are available in a range of colors and patterns and may be molded to fit various configurations. Costs range from a total price of $50 to $100 per square foot. Granite tends to be the leading material for stylishness and sophistication. It comes in both tiles and polished slabs. 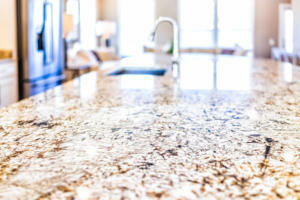 Granite is expensive, but it is scratch-resistant and durable, although it can be chipped, for example, if a pan or appliance is dropped on a corner. Granite is the second-most popular countertop for kitchens. 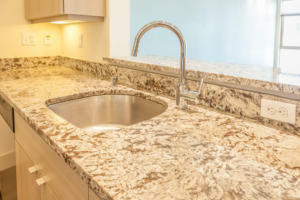 With a typical total cost ranging from $35 to $140 per square foot, granite is the second-most often used material (83 percent) for countertops. Premium slabs with a custom edge are an additional cost. However, granite is one of the most beautiful countertops. Marble is used in 43 percent of kitchen countertops, following quartz and granite. While it can be more expensive than either of those two, its opulently veined patterns give it a matchless look to the kitchen—each slab of marble is one of a kind. A marble countertop offers an elegant touch to your kitchen. While requiring more care than either quartz or granite, marble is incomparable in beauty, and is available in matte, polished or leather finishes. Marble is compatible with most classic or contemporary designs and becomes more cost effective over the years. Solid surface countertops are tied with marble for popularity (43 percent). These engineered acrylic materials are offered in a range of colors and patterns. Such countertops rival quartz and granite for quality, yet they offer lower prices than stone or quartz countertops. Beyond these four countertops are less common types such as butcher block, concrete, porcelain, laminate, recycled glass and stainless steel. Once you pick your countertops, it’s time to focus on cabinets, floors and appliances. With countertops, cabinets and floors following simple designs, you will be able to change the theme of the kitchen easily and frequently without replacing expensive appliances and other pieces. White cabinets and dark counters provide many options for kitchen themes. One of the most popular and timeless combinations consists of white cabinets, dark countertops and floor tiles that use a pattern of both lighter and darker hues. Maple, cherry, oak and pine are the top picks for wood cabinets but as an alternative, high-pressure laminate is popular and less expensive. Cabinets are a major kitchen expense and can range from $2,000 to more than $10,000, with installation running an additional $4,800 on average. Custom cabinets are considerably more. The big three appliances include refrigerator, range and dishwasher. While white has been the classic finish since the early 20th century, stainless steel has been popular for the last 20 years. Black stainless steel is the latest trend, adding to the options for a great-looking kitchen. For a seamless look, a built-in refrigerator is a must, although more expensive than a standard or counter-depth one. Built-ins are usually taller appliances, and feature the compressor on the top of the refrigerator. They aren’t movable as a standard size would be. Matching ranges, dishwashers and microwaves are available to complete a sophisticated look. There are a wide range of prices and features, so a bundled suite of appliances makes sense for your kitchen. It’s a fun experience to design a new kitchen and shop for cabinets, countertops, flooring and appliances. Plan to spend considerable time in all aspects—the finished project is well worth the effort and will be a statement for years to come. Take the first step in kitchen remodeling in Westlake, Ohio, by calling Sciarappa Construction at (440) 930-2882 or by email at info@sciarappaconstruction.com. Sciarappa Construction is located at 32961 Pin Oak Pkwy., Avon Lake, OH 44012.